A rainy Wednesday in March brings to mind the memory of orange, chocolate-chip scones. Sweeties has been closed now for a handful of years and we’ve all grown accustomed to having to leave town for gas or a six-pack, but the absence lingers like a loved one, and sometimes rises like an ache, particularly in wintry months or on rainy days like today. Marlboro School was at the center of last week’s Pre-Town Meeting in response to Act 46 which seeks to consolidate school governance. “Forced, short-sighted, rushed through legislation,” is how one woman described it. I know not everyone can make it on the first Tuesday in March, and I know that efforts in other towns to shift the meeting to an evening or a weekend haven’t produced the desired results; But our old Town House fills up with body heat and breath and voice and community, and that’s something. And even in the years when you’re not in a chair or on a bench or at that front table or up at the podium, the gathering holds space for who we are and how we live and what happens here, not just in Marlboro, but all over the Green Mountain state, and even across our nation, as Bernie proved to be true. Sure Town Meeting would continue for awhile; the old timers here are hearty like that; but the absence of the school budget–ie. the absence of children at the heart of decision making–would hollow out the gathering, until it became a dusty relic of itself. 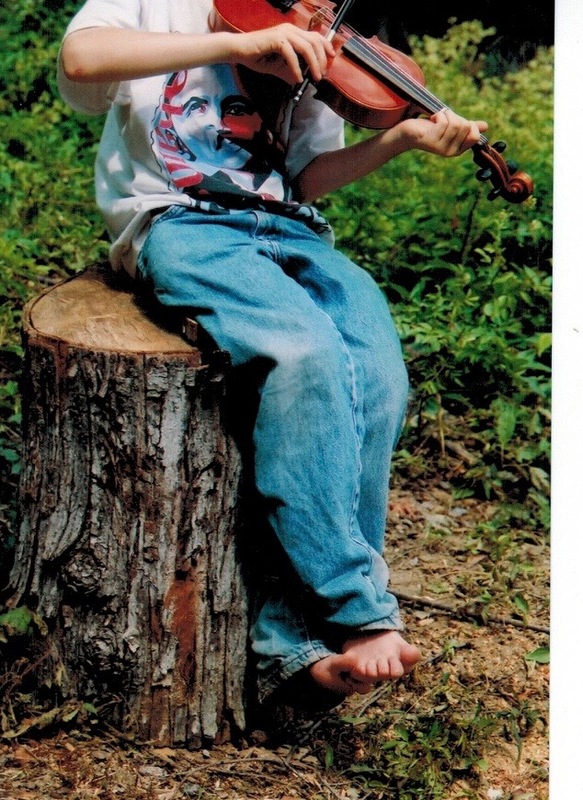 I think my parents suggested fiddle because there was this insane teacher named David Tasgal. 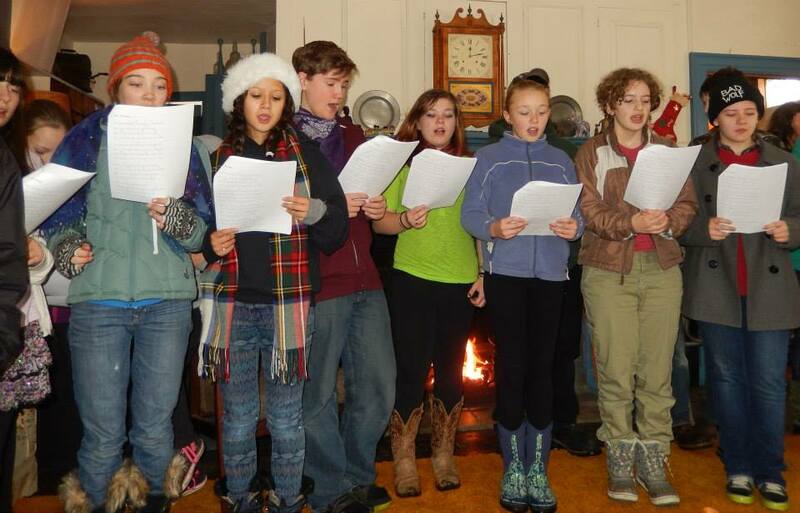 He was kind of nuts, but he had an amazing ability to communicate music to little kids…. He was definitely an inspiring figure for me, not only musically, but also because he had this slightly cracked sense of humor. He had this deadpan vibe that I thought was hilarious. • (play with) fiddle or tamper with: has somebody been playing with the thermostat? I never thought about David’s age before, but if I had to guess, I’d say early sixties, which is why I dismissed the news that a 72-year-old man was struck on his bike on Bernardston Road in Greenfield, Monday afternoon. David’s collection of music instruction books. My youngest son, Aidan, who studied with David from 1st through 8th grade, believes that one tune in particular had a handful of title changes over the years: Song for a Pet Who Died became Song for a Pet Who Ran Away became Sad Clown Fish became The Lonely Fiddle–all in attempt to make the children less sad. Aidan also marveled that David could compose a tune such as The Duck Song–from a single note–and still make it “interesting and satisfying.” As a parent and a teacher, it was particularly pleasurable to see so many children, of all ages and skill levels, play together, and David’s unique approach made that possible. David swept in for school events wild hair and wild shirts, and then began without fanfare, keeping the focus on the violinists, while enthusiastically accompanying them on piano. In fact, it’s at the piano that I remember David best. I loved the mornings when he’d arrive a bit early for lessons–at the tail end of All School Sing–and then slide his way onto the piano to add pizzaz to our last song. 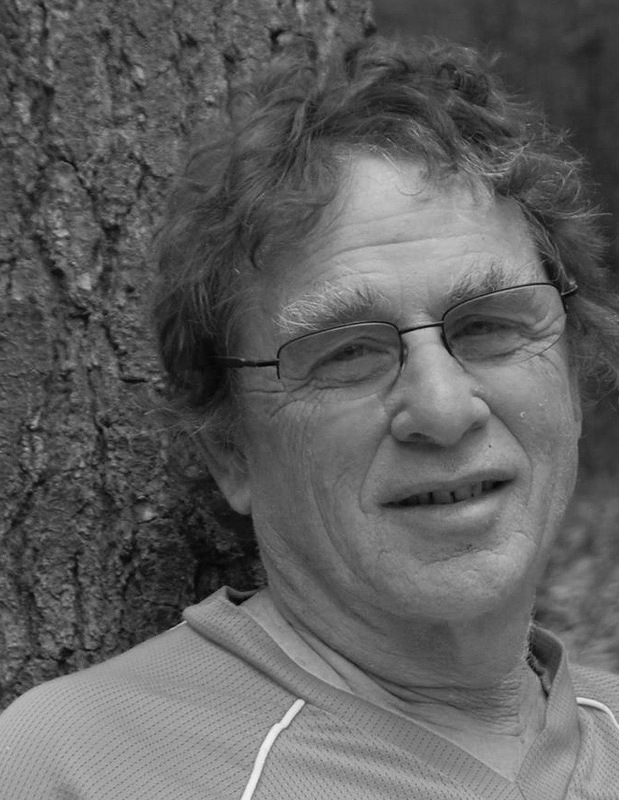 On the evening after David died, I entered the school auditorium to teach yoga, but felt his presence so strongly that I could barely begin my class. To soothe myself before I left, I placed a small light on the piano to sit shiva with David’s spirit through the night. We lit a candle at home that night too. Our older son, Lloyd, 20, who was in David’s very first class at Marlboro recalls how perfectly David tailored lessons to engage him and his more sports-oriented peers: “At one point, he gave us percentages so that we’d compete with each other,” Lloyd recalled. Aidan was uncharacteristically quiet as his brother reminisced. Aidan graduated from Marlboro in June, and on that night he tucked a small gift aside–a bar of soap–his favorite because of its crazy colors and textures and how he gets to slice it to size–and especially because of its name: Dragon’s Blood. He thought David would like it too. 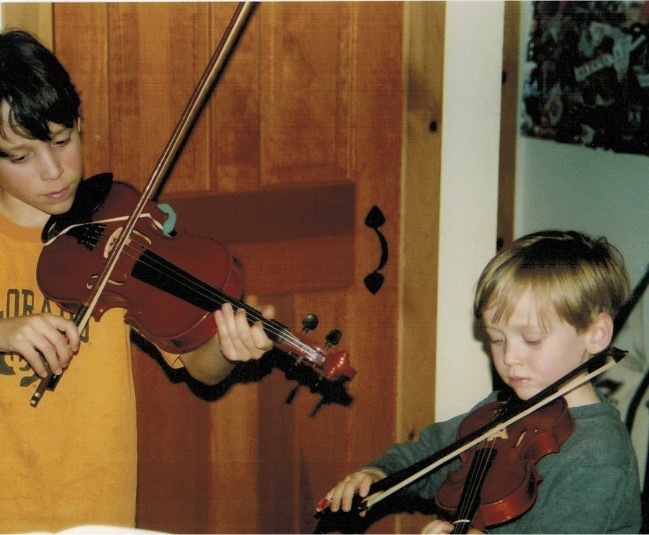 Our boys practicing together, many, many moons ago. My 13 year old sits slumped behind me in an arm chair in my office while I blare Dave Matthews, Ants Marching and then Last of the Mohicans–two “cool” songs with engaging strings that I hope will entice him to play along and reignite his lost passion. The violin sits on his lap. Things between them almost ended–abruptly–two weeks ago, though truthfully, they’ve been on the rocks since Lloyd was about 10–the time of the First Violin War–an apocalyptic parenting moment–complete with yelling and threats and stalemates–followed by the stark realization that I had crossed the beginning of the end of my role as commander and chief. But a deeper truth is that Lloyd and the violin have been together forever, into their ninth year, and they courted even before that. 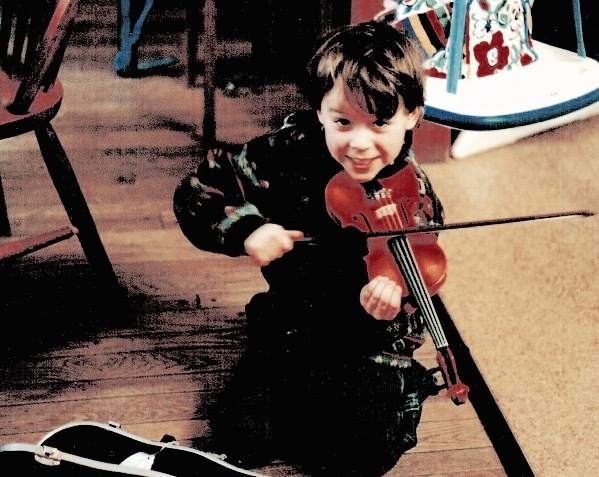 As a toddler, Lloyd offered rapt attention to any string music he came across–live or recorded–contemporary or classical; and as a preschooler, he brought the same toy guitar to show and tell every Friday, while truly longing for a violin. When we finally found a toy one to match the guitar, he was at first delighted, and then quickly disappointed with its inferior sound. 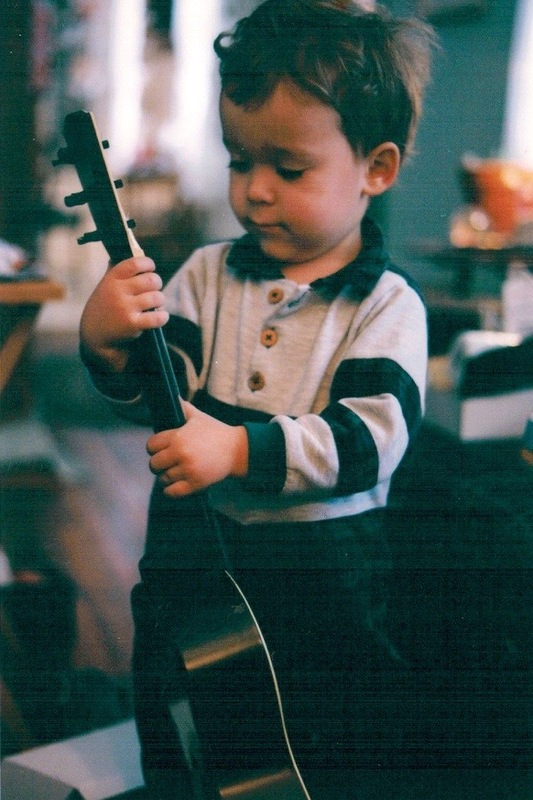 He insisted he needed a “real one,” but as neither my husband or I were musicians, we didn’t know how to go about that for such a small child. We climbed a set of steep stairs, and entered a small shop where violins–of all sizes–hung from the ceiling. I felt like a fish out of water, but Lloyd looked up in wonder. Reverent. Riveted. The shopkeeper came around the counter, took out a tape measure from his apron, and sized Lloyd up. Lloyd with his first “real” violin. “Come back in a year,” he said. But when he entered kindergarten that fall, something magical happened: the school instituted a pilot program with the Brattleboro Music Center and Lloyd came home carrying a case with the real thing inside. Despite his passion, Lloyd was not a virtuoso, but he stuck with it, year after year, and so did the school–deciding to continue the program until the fourth grade when children could begin traditional band instruments. But he isn’t resolute. He is miserable. Torn. Angry and frustrated. Feeling betrayed, by himself. With so much at stake, I feel the Second Violin War coming on, but now I am a wiser or at least less foolish parent, so I suggest we reach out for support. I quickly compose an email to dispatch to family members–cousins and grandparents, great aunts and uncles, and regular ones too. Do what you want, says one. You can always pick it up again. Stick with it, says another. You’ll never pick it up again. We don’t know what will come of this spark, but it warms us, particularly in its timing. We attended David’s funeral together. No one even balked at the suggestion. Not Lloyd who was leaving that afternoon on the train for Burlington. Not my husband who had to arrange coverage for his classes. Not Aidan who was… well… 15. The music was exquisite. The service solemn and playful and irreverent. At one point, a handful of children came forward to play some of David’s pieces for beginners. I nudged a reluctant Aidan to join them. He sat firm in his seat until he saw another same-age peer, across the room, move toward the altar. 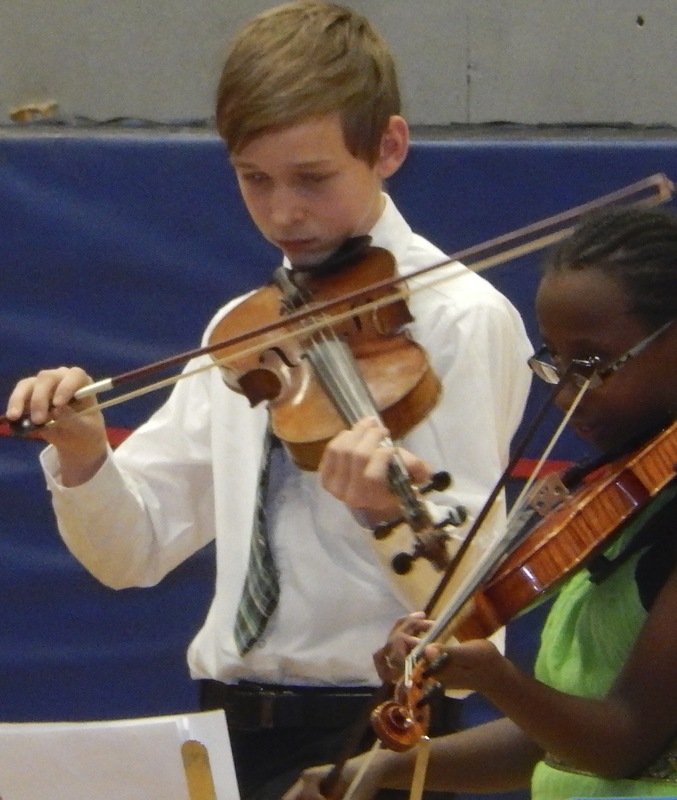 Aidan playing beside a younger peer at the last concert with David at MES. Aidan swiftly brought the violin case, hidden between his knees, to his lap, and as he did, I felt the collective attention of all those who shared the private mourning space around us. We watched transfixed as he opened each latch, and carefully lifted the instrument from its bed, and then there was a palpable embrace as he approached the altar on our behalf. When the children began the last of three pieces, we were invited to hum along, after which we accidentally broke into the applause we had held inside for the soloists who had so stirred us earlier. 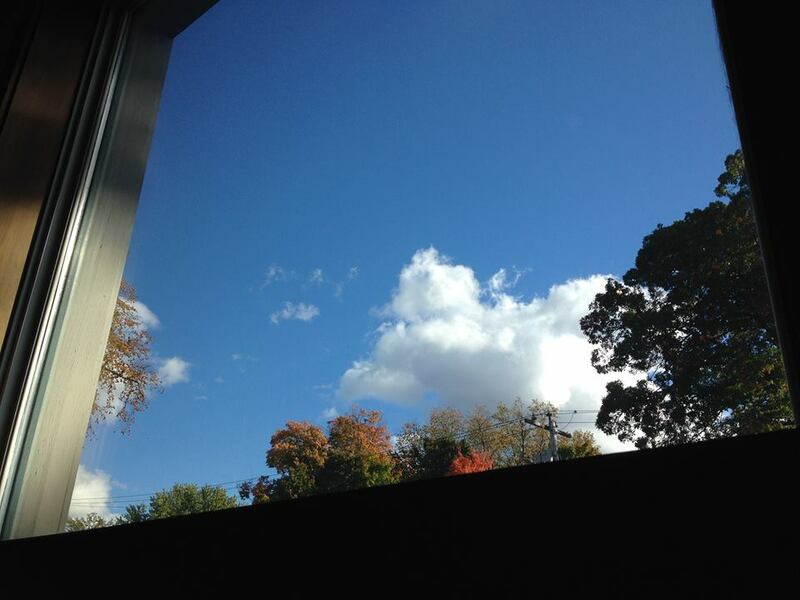 The sky was a stunning blue as we exited the temple doors that afternoon; the surrounding streets lined with the cars of those who came to grieve David’s departure–students, colleagues, family, friends. As we walked, Lloyd spoke to me of the music–of the viola solos–played by loved ones. 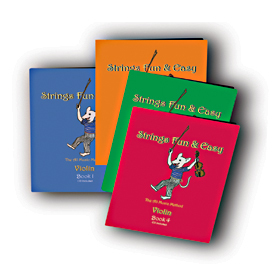 To find out more about David’s approach to teaching violin, or to purchase his curriculum, see his website: Strings Fun and Easy.